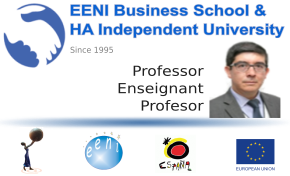 Syllabus of the Online Course (Subject): Andean Community (Bolivia, Colombia, Ecuador and Peru). 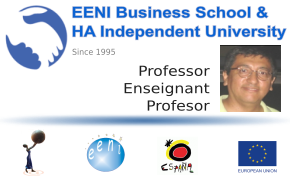 Description of the Online Course: Andean Community (CAN). 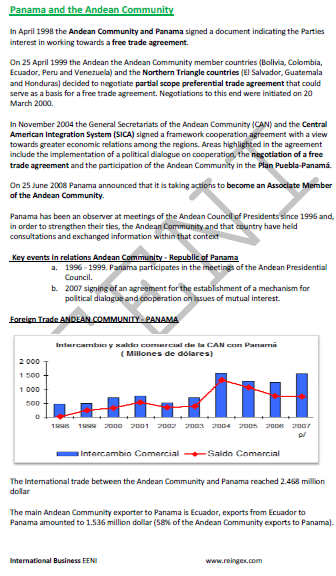 The Andean Community is a regional economic organisation endowed with an international legal status. 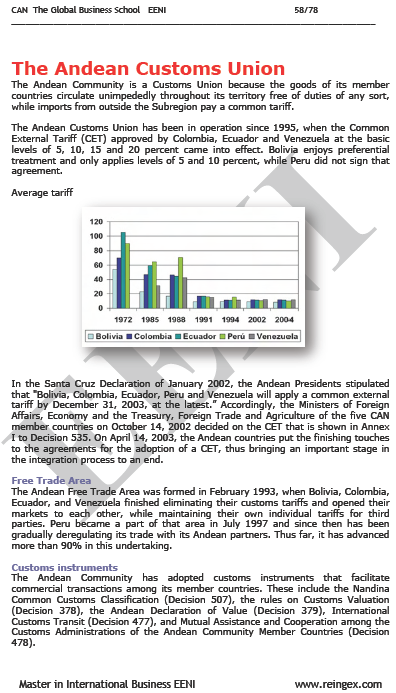 The member economies of the Andean Community are Bolivia, Colombia, Ecuador and Peru. The bodies and institutions of the Andean Community form the Andean Integration System. 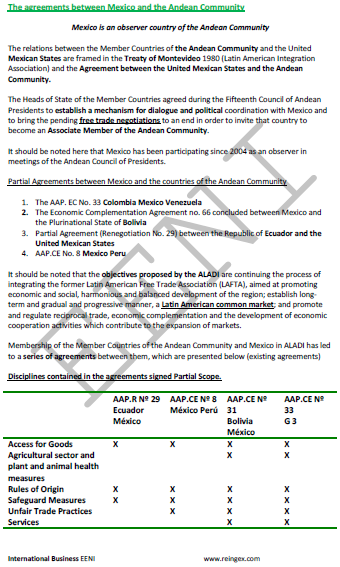 The Andean Integration System is a set of bodies and institutions forming part of the Andean Community, intended to allow for an efficient coordination between them to maximise the Andean subregional integration, promoting their external projection and strengthen the actions related to the integration process. 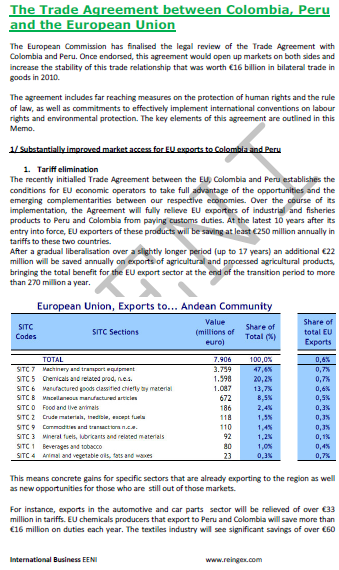 Andean Community Free Trade Agreements (FTA). 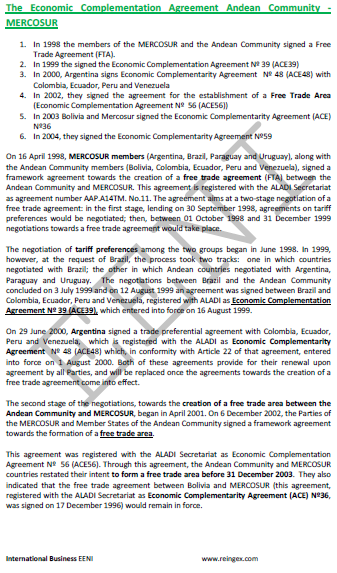 Andean Community Agreements in America: MERCOSUR (ACE), Chile, Mexico, and Panama. 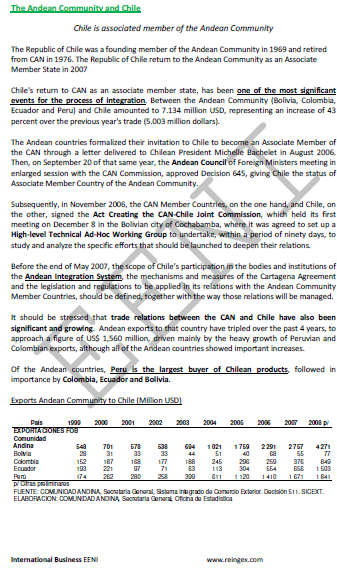 The Andean Community Extra-regional Agreements: European Union (EU), India, China, and Russia. 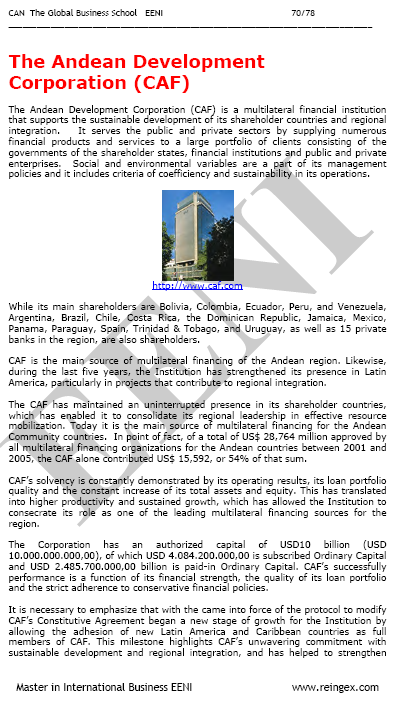 The Andean Development Corporation is a multilateral financial institution that encourages the sustainable development of its shareholder countries and regional integration. While its main shareholders are Bolivia, Colombia, Ecuador, Peru, and Venezuela, Argentina, Brazil, Chile, Costa Rica, the Dominican Republic, Jamaica, the United Mexican States, Panama, Paraguay, Spain, Trinidad and Tobago, and Uruguay, as well as fifteen private banks in the region, are also shareholders. The Andean Community belongs to Latin American Economic Area (Western Christian Civilisation).